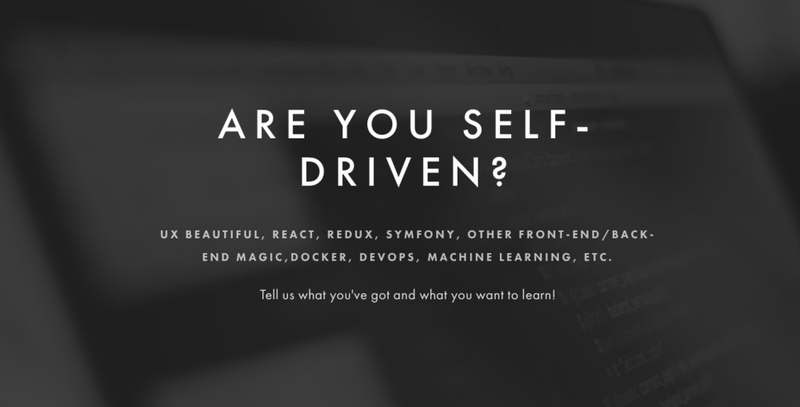 UX beautiful, React, Redux, Symfony, other Front-End/Back-End magic,docker, devops, Machine Learning, etc. Tell us what you've got and what you want to learn! Are you the one to join us on our journey to the next level? We want to hear from professionally ambitious folks who cherish learning and who want to push themselves, their colleagues and the company itself to be better every day, but who also want to be a part of highly skilled team of nice people to support everyone’s growth. We believe that roles adapt to people, not the other way around, so the people we'd like to hear from buy into our values, have the urge to learn and want to set the bar continuously higher not just for themselves but for the team and the company as well. If this sounds about right to you, come and join our team in Helsinki, Finland or in Prague, Czech - or switch between the offices. We are interested in people who have a combination of talent, professional pride, but also humility to understand that we all make mistakes, no one is perfect and we all have a never-ending need to continuously improve ourselves. If you see yourself as part of our team now or in the future, get in contact regardless if you'd be most interested in being UX designer/developer, a hands-on Architect, Front-End-, Back-End developer or a DevOps engineer, or if you'd have a soft spot for ML, Data Engineering, Data Visualisations or some other piece of interesting technology. We have challenging enough tasks to fit any skill level, i.e. we'll have interesting stuff to work on should you be a seasoned pro with an extensive know-how, or should you be freshly graduated with a bit less experience. At the moment we are mostly in search of mid to senior level developers, so you would preferably have hands on experience to some extend either from work or just by doing stuff by yourself. Our roots are from consumer facing web services, but we have since pivoted to pure business-to-business domain. Because of our background we are most interested on that our product fits the end user needs, not some needs of the managers. The software we do must create value to the everyday life of the actual users. At the moment we have altogether 18 persons from 5 different nationalities working full-time with our product. Our offices are located in Helsinki and in Prague; if interested, one can change between the offices for a shorter or longer time, and still be able to continue work with the same highly skilled team and solid product. We operate a bit like a startup, but we are not a traditional one by any means. We are almost 10 years old and have a AAA credit rating, but at the same time we are very R&D oriented, and we like to keep things agile and interesting, and we invest continuously in new technologies. We have a super flat hierarchy, and everybody is more than welcomed to take part in decisions, but at the same, we have the financial stability, security, and a focus on long-term quality and goals. We might be the thing for you if you think you would like to work in a product house. This means there is no traditional consulting or project work with us, but it does not mean that our job tasks would not be diverse or demanding. They are, as much as one wants them to be. Basically, an own product offers an infinite possibilities to get better and improve one’s skills as people are all the time getting more and more challenging tasks: if something turns out to be a recurring work routine and/or too easy to be interesting, then we'll need to find a way to make that go away (with a good software solution and/or automation). Our tech stack is a modern, API centric code base that's continuously under refactoring to make it cleaner, simpler and better. It includes buzzwords such as: React, Redux, Redux-Sagas, Immutable, Flowtypes, Sass, Babel, Webpack, Symfony, Swagger, MongoDB, Machine Learning (pytorch, ML platforms, etc), Event Streaming, Git, Docker, Ansible, Jenkins, Nginx,etc. And we are looking into PWAs, Elastic, Kafka, Redis, Elastic and whatnot. You don't have to be experienced on each and each and every one of tech pieces. The tech always changes, so motivation, getting things done, curiosity and a hunger to learn are the most important capabilities. If you know some of the tech above already, that’s perfect. If you're motivated and a quick learner, that’s as good. Nobody can be really good at everything, so you get to choose your weapons and/or bring your own favorite cutting edge tech piece on board - if it adds value to the product. You would be working, like the rest of us, with our PACE product. It's technically - and commercially - a lot more sexier than might meet the eye as it is build as a platform in its own right.We are aiming to make an impact, not only to our own customers, but to our customers' customers as well. We are going to make it big. We have already made a pretty good progress on this path. And we are cashflow positive & growing. If this is not for you - perhaps this is for someone you know? Please give a nod to that person, so they can check if they'd feel there could be something for them here! Challenges. Our tech ambitions don't lay in easy-level implementations or modifications. We aim high and higher, i.e. when you might otherwise start to get too comfortable elsewhere, with us you'd probably have just moved to a next puzzle. Responsibility and room to grow. You get all the responsibility you want to and are ready to handle… and can pull off. A possibility to hone your skills to the max and beyond. We cherish learning. A possibility to extend your knowhow to new domains. We take regularly, preferably weekly, time to learn and to play with new (or old) things. Of your own choice and interest. A work role tailored to you. People do things, roles don't. At the end of the day your work role will be the one you are most interested in and the one that with you can bring most value to colleagues and to the company. And it can change during the ride, if it should be so. As it probably will. Flexibility. As much as you need and as much you can handle without letting the others down. Freedom. You can work from the office or from home, early in the morning or late in the evening, four days a week or full week or however. As long it works out with rest of the team, i.e. your doings don't negatively affect others. Influence. Monthly 1-on-1 talks with the CEO through discussing values and how things could be done better. Psychological safety. We are very stable from the financial point of view, but we think we are that from the mental side as well. Our aim is to disagree as strongly with these statements as possible. We help each others, learn from our mistakes, and have room to grow. Very flat organization. We also kinda hate meetings for meeting's sake. Basically this means you have a lot more time to focus on getting better on your interest areas and actually do work. Life outside work (or a possibility for it). We believe a normal amount of working hours should be enough to make a difference. Some perks: depends a bit on which office you choose, but in general we offer an office with a central location and other perks to make life easier (for example in Helsinki home internet, mobile subscription, extra insurances covering spare-time incidents and illness, good occupational healthcare, dental services, sports vouchers, a possibility to get lunch vouchers, transportation vouchers). Spotify Premium to accompany your new nice noise-cancelling headphones (not still available in Prague, as Spotify does not offer vouchers there). Concrete support for learning: want a book? No problem, we order it. Useful conference [abroad]? We do plentiful of those every year. Interesting web course? Lets enroll. Coaching? We have an on-going system. Something else? Of course. A competitive paycheck every month. Even if we like to think that we are agile and flexible as a startup, we are not going broke anytime soon as we are cashflow positive without outside funding (we're growing too). As far as base salary goes, we are not the salary leaders of the industry, but we are at higher levels than the average. All things considered - see also employee dividends - we'd say that our overall package is more than competitive, but it's up to you to decide if it is that for you. Employee dividends program. This makes things interesting. Every year - if it has been a profitable one, as it has been every year to this date - a good chunk of the profit, without a max capping limit, will be shared to employees. If the company succeeds, everybody making it will. What our team members have said about working in Rohea. Rohea has given me the opportunity to push myself outside my comfort zone. I’m learning new things constantly, which can be hard, but with the support and patience of my colleagues, I feel confident I can do it. Rohea is a bunch of really awesome persons. I promise, you will be laughing a lot. Even when things get hectic, you can trust that somebody will make a joke. Although, the joke probably won’t be good. When starting a new job, one of the things that worries both the current/prospective employees/employers is team fit. But I can say that, if you read the Rohea's values and feel they match yours, there won't be any issues fitting the team. At Rohea you don't feel limited in pursuing your own way of doing things. Self-learning, discussions, experiments are highly encouraged, especially if they might result in something applicable to the company's products. Summing up, trying by doing, discussing the "doing", and improving it is what Rohea is all about. As such, it's a great place to work. I came to Finland to study and by chance stumbled across Rohea’s hiring page. I am no longer a student but I have never been learning so much as I am now. At Rohea I found a place where if you have an idea and take the initiative, you are given the chance to make things happen. Combined with a lot of freedom, it is a great place to grow. From the perspective of a foreigner, I truly appreciate the inclusive and friendly atmosphere at Rohea that make me feel at home. Developing a product means that you end up savoring the fruits of your work countless times in the future. Working in a small company, on the other hand, means that you'll most likely be the one fixing them if they're not doing their job. This if anything should teach you a lesson about quality. Another positive aspect about working on a product is that it constantly invites you to refactor and re-design components. As a consequence, it's difficult to avoid growing as a developer in the process. Rohea is a place for doing. If you see something that could be done better, you go and improve it. If something isn’t working, you fix it. Colleagues are supporting and helping you to accomplish what you want and need to do and (often) provide some humorous interludes while doing it. I enjoy the atmosphere of freedom and constant learning that reigns in Rohea. Rohea is fair and humane. You will be given time and opportunities to better yourself, but you also need to show results, which is fair. You will be treated with respect and consideration, but you also need to take responsibility, which is humane. As it is in all things, it's all up to you. Working at Rohea is great for personal growth and self-fulfillment. We're encouraged to find use for our many talents and interests, and to be diversely involved in all steps of the process. This builds a good sense of purpose and commitment to the end products. In my experience Rohea has been a fair and flexible environment to create great things. With Rohea the tasks have always been diverse and how you go about them is mostly in your hands. My main selling point is that you won't be stuck in what you do, you will always be improving yourself and can influence the tasks you will be undertaking. It won't always be easy, but good things never are. I've always find it fascinating that Rohea has never been stuck in just certain way of getting things done. Latest technologies and trends are adopted regularly which is why methologies and tooling tends to follow best practices. But to be honest, that's also why there's always some legacy code to refactor or technical debt to pay off. Overall Rohea has provided me a path from programmer to DevOps engineer, so there's always room to grow and take more responsibility. Rohea is a place that gives you a lot of freedom how to do your work. You have a say in your tools and in your approach to problem solving. Do you sometimes want to work remotely or even take a few months and set up office abroad? If you can do it responsibly and the flow with your teammates works, it's completely doable. Results matter, but if it works, how you do it is open for discussion. At Rohea, I appreciate the trust I can put in my co-workers and the trust I receive myself to do the work in ways I find most fulfilling. Rohea gave me inspirational environment and mindset. Company’s inborn drive to make friendlier software gives you great place to display your passion to build great products that you can be proud of. I’ve dropped out from daily life at Rohea few years years ago in order to become medical doctor. Now when looking Rohea outside the box, I’m very happy to see a positive energy and team that aspires to create products that are both beautiful and friendly both end user and developer point of view. We're growing a company where building high quality is the default state of mind. We iterate, improve and refactor, most of the time without client asking to. It means you won't get thanked for doing normal but cheered if you find a way to work your magic better. I'm the guy who asks people to fix their naming schemes to follow a pattern I figured out and probably forgot to tell about. In a wider sense, I think every single part of a software needs to be thought through with loving and caring attitude. Solid argumentation is how things get decided most times. We have our up and downs, but I do believe that people who are self-driven and hungry to learn will be happy with us. I do put a lot weight on work ethics and I'd get irritated if somebody would seem to be "just working", e.g. seem not to be interested in reaching their full potential (and then some). We put much emphasis on quality and continuous improvement. And to a freedom of being yourself. Me myself: I try not to get into way of people doing stuff or micromanage. Sometimes I fail, but luckily when I do, I'll mostly get instant feedback to back off. That is good. Please send an informal email to Eero and Daniela - feel free to send it in Finnish if you wish - to learn more and to start a conversation. From your end, please tell, for example, how do you see your fit to our culture and values, what things you already have experience on, what you'd like to learn, what you are interested in, what have you done before, what things you are interested in, a CV or a link to your LinkedIn profile, desired salary, etc. If you have a portfolio or a github account or similar to show what you have done before, please provide a link.